Punnett's Square: New DNA "shredder"
CRISPR technology has advanced in the previous months, with the new use of Type I CRISPR-Cas3. The CRISPR-Cas9 is compared to scissors, snipping pieces of DNA, but the new tool has been termed as a "shredder" of DNA. It can be used to target and delete much larger pieces of DNA than the Cas-9 tool. In the research done, the new tool was able to delete targeted portions of DNA from a few hundred basepairs to 100 kilobases. 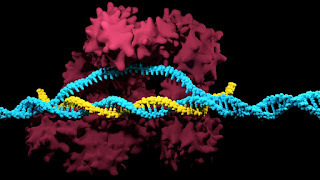 The Cas-3 tool moves along the DNA genome while breaking up the material as it goes. The leading researcher said it was a "shredder with a motor." This is very important for continuing research in figuring out ways to treat diseases. It can be used as a screening tool to see what part of the DNA is most important for certain diseases. The new CRISPR tool can wipe out large stretches of DNA that are non-coding to see what would happen.